The year 1917 saw the first class of nurses graduate from the new IU Training School for Nurses, part of the School of Medicine in Indianapolis since 1914. Among those five women was one who could claim another “first”–Josephine Grima (1892?-1993), the first student to enroll at IU from Mexico. Born around 1892 in the northeastern state of Tamaulipas, Grima was apparently encouraged by members of a Society of Friends mission from Indiana to return home with them to complete her medical training. After nine months of preparatory work, Josephine entered the three-year graduate nurses program in the fall of 1914. During their three years of training, which mainly took place at the Robert W. Long Hospital, Grima and the other nursing students experienced a rigorous routine of “full-time duty in the wards and classrooms.” Types of courses ranged from the preliminary classes on biology, anatomy and physiology, hygiene, sanitation, and household economics to senior term lectures on obstetrics, children’s diseases, mental diseases, and social service. 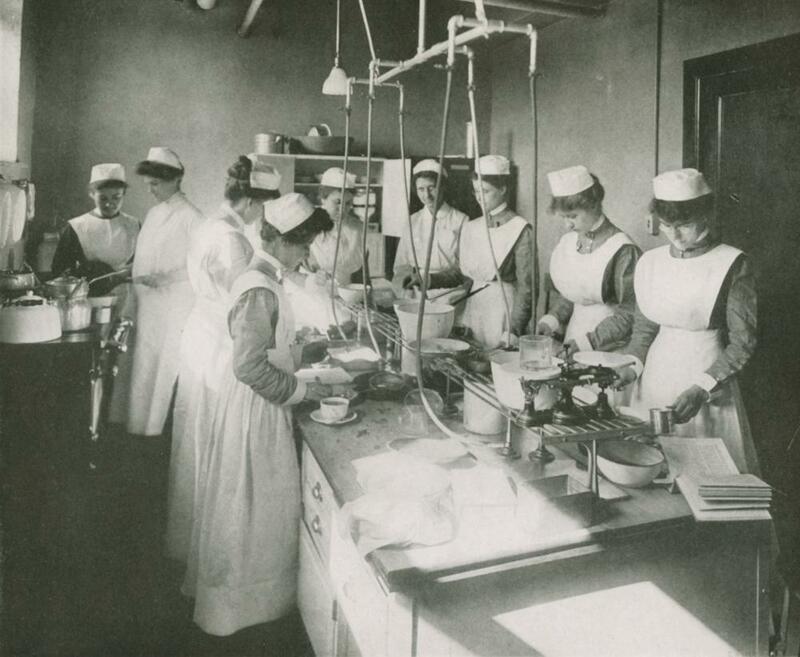 Students at the Training School for Nurses during the 1916-1917 academic year. From the 1917 IU Arbutus yearbook. As Grima was finishing her final semester, the United States declared war on Germany, officially entering what would be known as World War I. Soon after graduating, she joined the U.S. Army Nurses Corps as a reserve nurse. While she never deployed overseas, she nevertheless saw her share of action during the devastating flu pandemic of 1918. She was first stationed at the army hospital in Markelton, Pennsylvania, before being transferred to Camp Devens near Boston, Massachusetts, in September 1918. 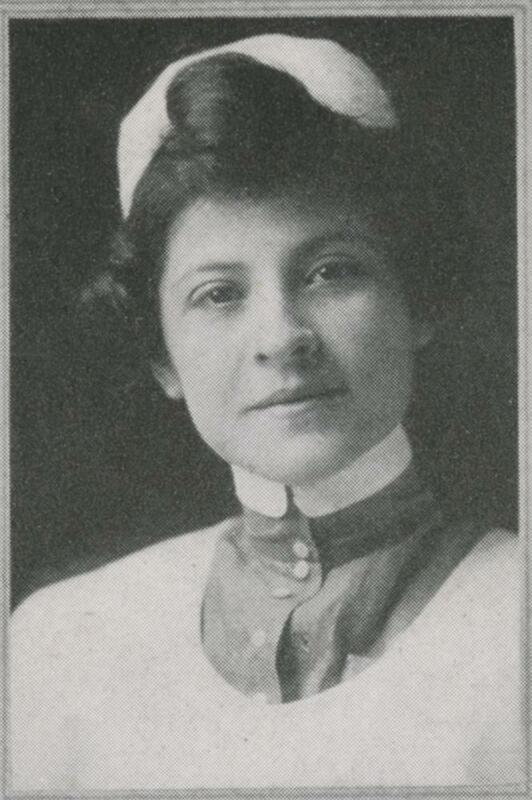 At the time, the training camp was in desperate need of medical personnel: with over 10,000 cases in less than a month, it was the site of one of the largest influenza outbreaks in the U.S.
Grima continued her nursing career for a time after the war, working at the Marine Hospital in Detroit, Michigan, before marrying and starting a family. She became a naturalized U.S. citizen in 1922. One of her daughters, Dorothy Comstock Riley, became the first female justice to serve on the State of Michigan’s Court of Appeals (1973) and the first Hispanic woman to be elected a supreme court justice in any state (1985). 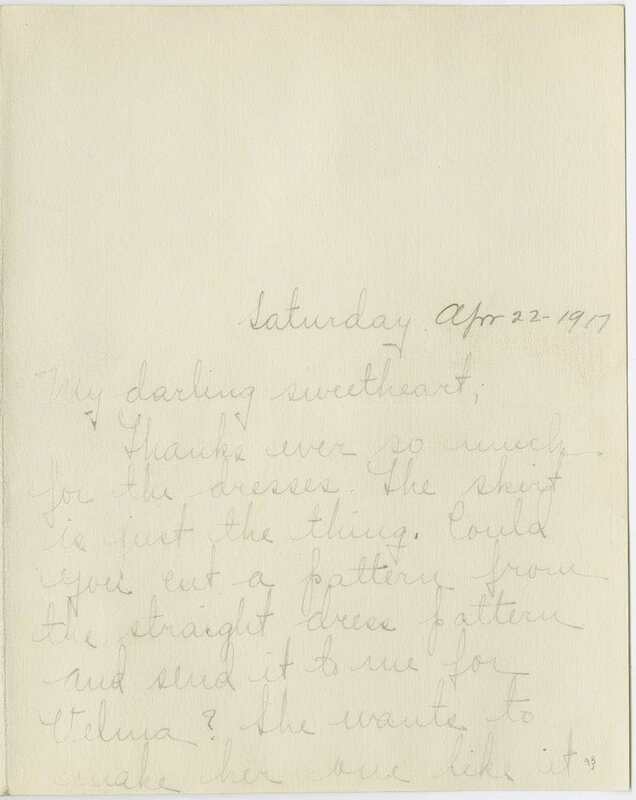 Last spring, the IU Archives was contacted by a kind couple in Lafayette, Indiana who just by happenstance discovered a small but wonderful collection of WWI-era correspondence and other ephemera in a dumpster. At some point lovingly bound into 2 volumes, the nearly 300 letters between Helen Dale Hopkins and her family dating from 1915-1918 were thus thankfully saved from a fate in a landfill. Born in 1897, Helen Dale Hopkins entered Indiana University as a freshman in the fall of 1915. She was an active member of the Classical Club, Browning Society, Pi Beta Phi, and was elected to the student honorary Phi Beta Kappa. She graduated with an A.B. in Latin with Distinction in 1918. 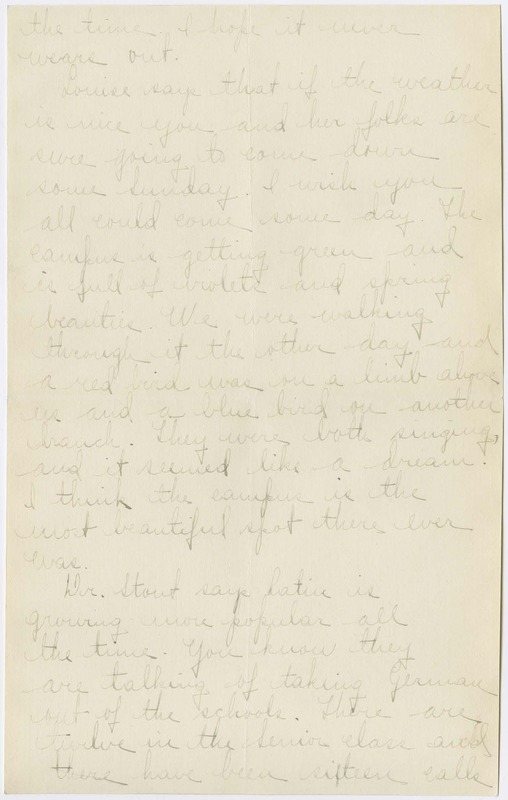 During this period, Helen wrote home multiple times a week, predominately to her mother Clara, but occasionally also her brother Bob (Robert O. Hopkins). Early letters report on joining Pi Beta Phi (the Pi Phi’s as she calls the sorority) and being in the library during freshman-sophomore scraps when the men were called outside and their hair forcibly cut. What we would describe as a modern-day foodie, in nearly every letter Helen reports on her meals (she seemed to have a particular fondness for potatoes and desserts), and vehemently thanks her mother for her weekly care packages of candies, cookies, bread, and wieners from home. 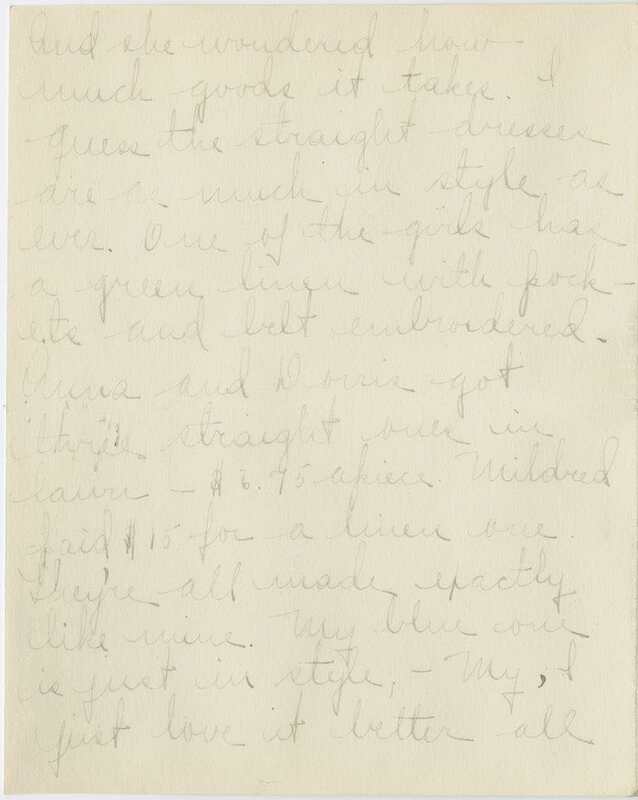 In others she describes the contents of her friend’s packages from home, including one which included “a whole fried chicken and a fruit cake.” Other letters mention campus serenades, attending athletics events and dances, joining the Women’s League and YWCA, late night visits to the Book Nook for wieners and burgers to hear Hoagy Carmichael play, hiking to Arbutus hill, going to the Gentry Brothers Circus, student pranks such as the night she came home to a bed filled with salt, as well as campus issues such as coal shortages and the bad taste of the drinking water. On a national level she discusses the 1916 presidential election and in the lead up to World War I she discusses military training on campus. 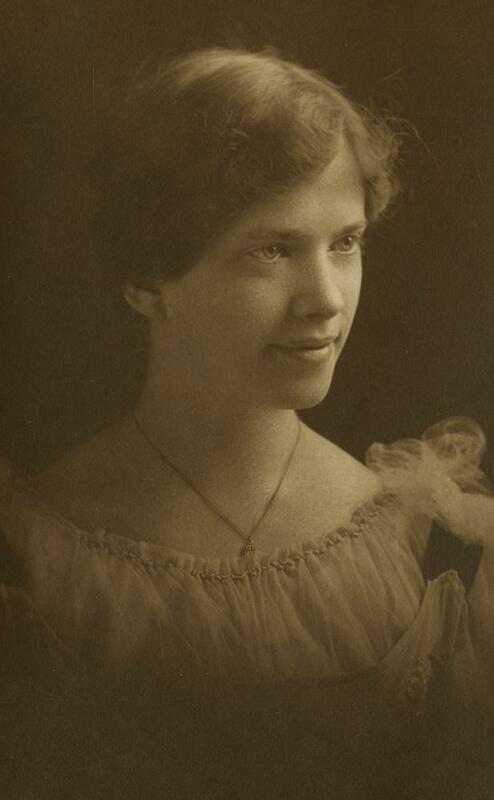 On March 7, 1917, she describes a campus-wide meeting of all the students and faculty where “it was voted to send a telegram to [President] Wilson expressing the faith of the Indiana students in him and the promise of loyalty to the country…. President Bryan gave most wonderful talk, and several others of the faculty spoke.” Following the official declaration of war, she reports on her volunteer work with the Red Cross knitting sweaters for soldiers overseas, female students hastily marrying before their boyfriends enlisted, the dwindling numbers of male students on campus, and the back to the farm movement, which allowed students from farming families to return home to help with the crops while still earning course credit. She also alludes to the fact that Theodore Roosevelt would be their wartime commencement speaker. One letter from April 1917 stands out in particular. While Helen mostly details daily thoughts and updates on life for her mother, she also shares the details of an incident involving a student of Russian descent (Mr. Edler). A transcript of the letter in its entirely follows. Thanks ever so much for the dresses, the skirt is just the thing. Could you cut a pattern from the straight dress pattern and send it to me for Velura? She wants to make her one like it. And she wondered how much goods it takes. I guess the straight dresses are as much in style as ever. One of the girls has a green linen with pockets and belt embroidered. Anna and Doris got three straight ones in town – $6.75 apiece. Mildred paid $15 for a linen one. They’re all made exactly like mine. My blue one is just in style, – my, I just love it better all the time. I hope it never wears out. Louise says that if the weather is nice you and her folks are sure going to come down some Sunday. I wish you all could come some day. The campus is getting green and is full of violets and spring beauties. We were walking through it the other day and a red bird was on a limb above us and a blue bird on another branch. They were both singing and it seemed like a dream. I think the campus is the most beautiful spot there ever was. Dr. Stout says Latin is growing more popular all the time. You know they are talking of taking German out of the schools. There are twelve in the senior class and there have been sixteen calls already for teachers. Velura is so discouraged that she broke down and cried the other day – she wants to come back so badly and everyone she talks to says that they can’t consider undergraduates for positions until all the seniors have places. Dr. Stout says that only one senior that he has known of has gotten less than $80; but he says they usually have to be satisfied with this the first year. I got all this information from being in the senior class. He put in a recommendation for each one of them. He even wanted to know in what part of the state they wanted to teach and what sort of a school they would prefer to teach in. He said he would be glad to read the letter of application they wrote before they sent it. He seemed so interested in every one of them. I spent the morning embroidering “Charlie” in mahogany silk on a pair of pajamas. One of the Phi Psi boy’s washing was left here and of course we thought we ought to embroider it. We embroidered hearts on all his handkerchiefs and his name on his pajamas and then cross-stitched the bottom in green and purple. Oh they were some class. I know he’ll like them. I hope so at any rate after all the work we put on them. I’m going down a little in math. I only got 90 on the test I had Thursday. I hope we don’t have many more or he’ll find me out sure. We decided to wait two weeks for our play, and so I don’t know what we’ll have Monday night – a good time anyway. Leah Stock, our province president, is coming Tuesday night. We’re going to move all the best furniture in our room. We’re going to have a dinner Tuesday night, a reception Wednesday afternoon, and a cooky-shine Wednesday night. Did you see the story about Mr. Edler, a Russian in school here? He lived in a barn on two cents a day. When he was four years old, the Russian government killed his father and mother, and ever since then he has been against the government. The authorities here found his room which he had always kept locked, and found there all sorts of different mechanisms that they think he was trying to make infernal machines of. He says he was only experimenting on watches. He went around all winter without a hat and coat. He was in my Latin class, but it never occurred to me to be afraid of him. I don’t know where they’ve sent him but he’s left here. Well sweet, I’m writing this in the midst of a stirring argument on woman suffrage; and I’m trying to argue and write at the same time. Marie’s going to stay all night with me. Her roommate has a terrible cough, and she keeps Marie awake all night. I thought that since Louise was gone, she might sleep with me. I went downtown with Mrs. Roberts this evening and she bought me a sack of candy. Some sport, eh? Well sweet, I owe so many letters I guess I’d better start writing some. Mr. John Edler was a Russian student at IU who earned the nickname “Hatless John” because he spent the cold Indiana winter walking around without the typical hat or coat worn by most people to protect him from the cold. According to the news coverage from April 1917, he was not a harmful individual but fellow students often heard him voicing anti-government and anarchist opinions, which raised some concerns. Finally, Registrar John Cravens and local authorities found cause and searched his room, where they discovered all kinds of mechanical parts that they assumed were being used to create “infernal machines” and bombs. Being that this was wartime, their discovery raised concerns and Edler was brought before a local Sanity Commission to judge whether or not he was a threat to the IU community and American citizens. The commission however deemed Edler completely sane and the mechanical parts harmless – in reality Edler was not in fact building bombs. He was a watch maker and his mechanisms could do no more than tell time. After the ordeal, Edler returned to his former home in South Bend, Indiana. Tobias Dantzig, a mathematics professor at IU took responsibility for the young man, promising to assist him in finding work, which further appeased the sanity council and the whole situation was resolved. To schedule an appointment to view the rest of the Helen Hopkins Wampler papers, contact the IU Archives. Indignant at the delay, Eigenmann went straight to the top with his protests. 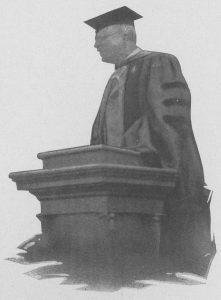 Besides writing to the presidents of IU and the University of Illinois, which granted Harris a fellowship for the journey, he appealed to former president Theodore Roosevelt and asked him to intercede with President Woodrow Wilson on his behalf. 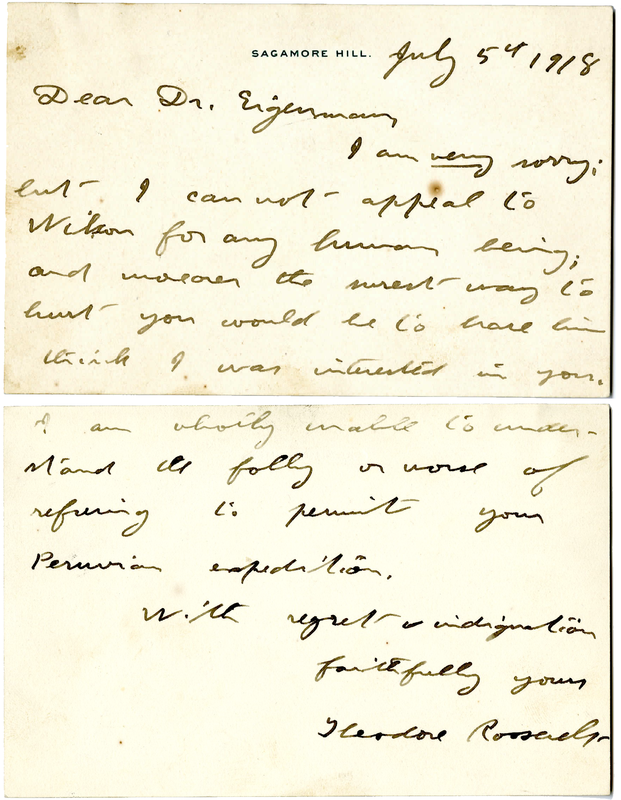 I am very sorry, but I cannot appeal to Wilson for any human being; and moreover the surest way to hurt you would be to have him think I was interested in you. I am wholly unable to understand the folly or worse of refusing to permit your Peruvian expedition. Who knew that the field of natural history could be so full of intrigue? “President Bryan made a statement to the Board concerning the German situation at the university”—Board of Trustee Minutes, April 17, 1918. For the past several months, I’ve been working to slowly transcribe the WWI-era hand-written minutes of the Board of Trustees for inclusion in this searchable online portal and one question has continued to weigh on me. What exactly was “the German situation”? 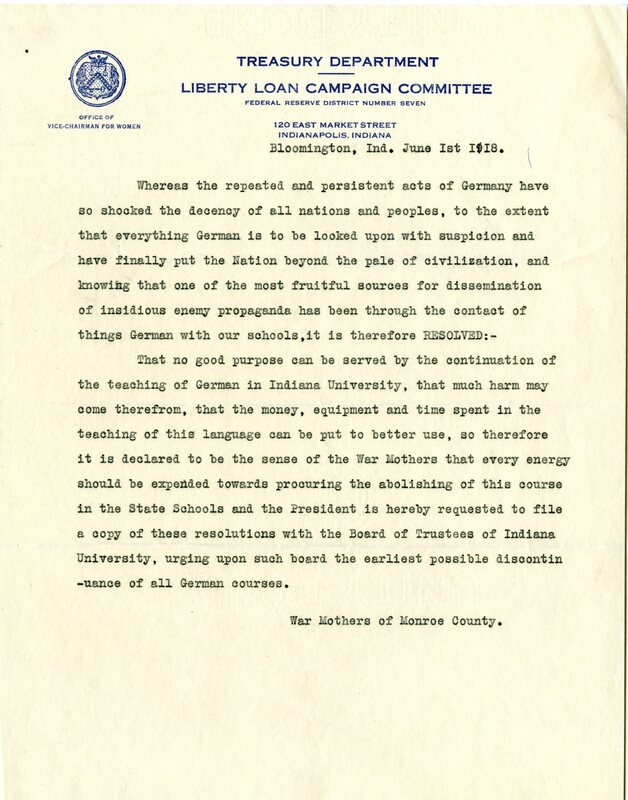 While the Great War raged in Europe, anti-German feelings ran high state-side and Indiana University was not exempt from coming under fire for associations with the enemy. After some investigation, the exact “German situation” is still a little vague; however, there are still some fascinating stories from the era. One of these controversies involved the teaching of the German language. By mid-1918 enrollment in German language courses at Indiana University had declined and only two professors, Bert J. Vos and Carl Osthaus, remained on the faculty. Across the country, teaching German in the schools (including universities) became a contentious issue. 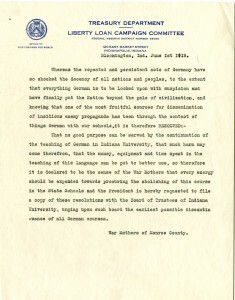 In June 1918, IU President William Lowe Bryan received a letter from the War Mothers of Monroe County which argued that “one of the most fruitful sources for dissemination of insidious enemy propaganda has been through the contact of things German with our schools.” They further stated that “it is therefore RESOLVED: — That no good purpose can be served by the continuation of the teaching of German in Indiana University, that much harm may come therefrom.” President Bryan coolly responded that the teaching of German would remain “as a means of fighting Germany.” When further questions poured in from individuals such as Dr. Perry Dickie of the American Defense Society, President Bryan responded that “German is not required for entrance” but that “we provide a few classes in German for students who desire it.” Additionally, by the fall of 1918 students enlisted in the Student Army Training Corps were learning German for military purposes. While controversy surrounded the teaching of German, two professors also found themselves at the center of the debate. History professor James McDonald found himself the subject of a Senate investigation when a German by the name of Dr. Karl A. Fuehr included him in his “important list of names” which the the Department of Justice stated were all pro-Germans. 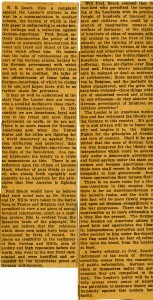 McDonald, however, demonstrated to the Senate Investigation Committee that the accusation was erroneous and that he was a loyal American citizen, stating that “Ever since the sinking of the Lusitania I have not merely privately but also publicly both in class and in the press strongly advocated the entrance of the United States into the war against Germany, as my students and associates can readily testify” (from a letter to the Chairman of Senate Investigating Committee, December 11, 1918). 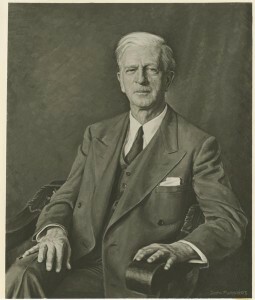 McDonald would go on to work first for the League of Nations and then for President Roosevelt’s Advisory Committee on Political Refugees in Europe. He recognized early on the danger the Jewish people faced from Hitler. McDonald would also become the first US Ambassador to Israel. The second and most controversial case was that of Professor William Zeuch. A young Iowan, Zeuch was hired in 1917 to teach economics at Indiana University. 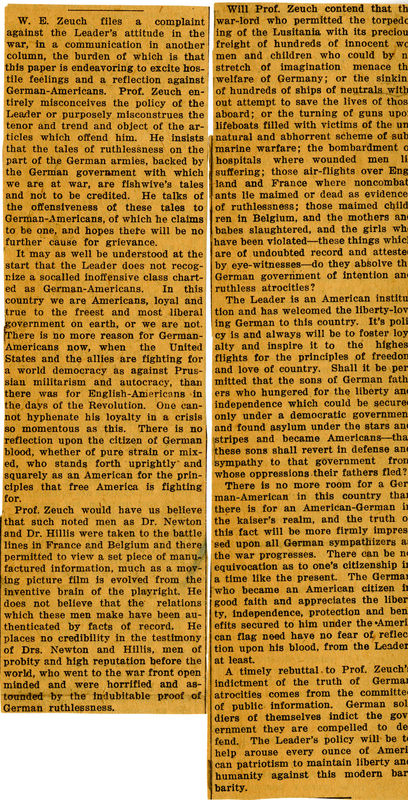 In November of 1917, Zeuch had replied to an Iowan newspaper’s anti-German statements, stating that the newspaper was printing propaganda and because the recent German atrocities were not unique to Germans as a race, the newspaper was thus offending German-Americans. The newspaper replied by thoroughly denouncing Zeuch. News spread to Bloomington, where Zeuch found himself under investigation by the Monroe County Council of Defense and a committee of professors at the University. The Bloomington Indiana Daily Student on November 14 reported: “Mr. Zeuch affirms that he had no intention of being disloyal or unpatriotic when he wrote the letter to the Hopkinson Leader. He said to a representative of The Student that he had been incensed at the attempts which have been made to arouse hatred against the German race, but that he wished to condemn its autocracy.” Newspapers across the state reported on the scandal and Zeuch was asked to resign from his position. He did and joined the Army, from which he was honorably discharged in 1918. After the war, Zeuch co-founded a short-lived college in Arkansas, Commonwealth College, with a program that reflected his sentiments for socio-economic reform. He was also a Guggenheim fellow in the 1930s and worked for the Department of the Interior. Zeuch co-founded a short-lived college in Arkansas, the Commonwealth College, with a program that reflected his sentiments for socio-economic reform. To learn more about either of these incidents or more about Indiana University during WWI, contact the IU Archives. The War Service Register records are now open for research at the University Archives! Used to the compile the original Golden Book housed at the Indiana Memorial Union (listing every IU alum who served in war), the War Service Register of Alumni and Former Students provides information on Indiana University alumni and former students who served in U.S. wars between 1860 and 1945 (i.e., the Mexican War, Civil War, the Spanish-American War, the first World War, or the second World War). The Alumni Office requested that each alum provide his or her name, degree, class year, dates of service, date of discharge, rank, and record. The amount of information provided, however, varies from student to student. For those students serving in World War II, the material is much more comprehensive and often includes newspaper clippings and correspondence between IU and the enlistee and/or his or her parents. There are records for dozens of female enlistees. The Record (filled out by alumni) included, among other things, blanks for present service address, previous stations, and the question “are you receiving the alumni magazine?” In addition to the paper records, photographs were frequently sent to the Alumni Office (now housed in IU’s photograph collection). Kathryn Griffith enlisted in the Marine Corps Women’s Reserve in July 1945. At IU, she was a member of the Women’s Athletic Association, Alpha Delta Pi sorority, and the Association of Woman Students. 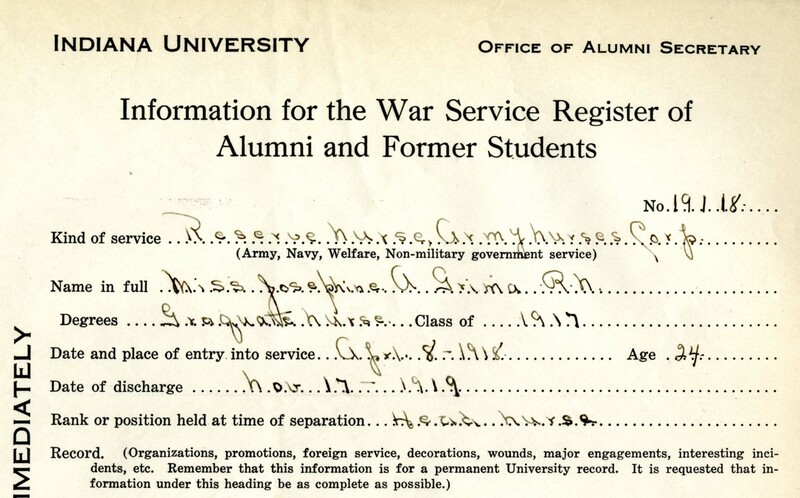 The Office of the Alumni Secretary, led by Humphrey M. Barbour in the 1920s, compiled the initial (pre-World War II) War Service Register of Alumni and Former Students, which provided information about Indiana University alumni and former students who served in a U.S. war between 1860 and 1920. The Alumni Office collated the register using alumni responses to a memo requesting information sent in the early 1920s. Cpl. Julius Griesel’s father responded to Heighway’s letter informing him that a wounded Griesel spent ten days in a German hospital, marched seventy-two miles to Italy, before finally being “liberated” by the Russians on April 22, 1945. Heighway often wrote to parents of MIA or POW soldiers expressing his concern and asking for updated information. There are many instances, such as the letter at left, when families wrote back with good news that their son was found alive. Not all replies, however, were positive. According to some counts, 288 former IU students were killed in action during the war. The Alumni Office requested that families of the deceased fill out a special form listing service information as well as place of burial. Most families also mailed photographs with the other information (such as the two shown below, Iceal Alford and Bernard Cederholm). On a personal level, these photographs were the most striking. The soldiers killed in action are indistinguishable, of course, from the rest of the photographs sent to IU. Yet, viewing their photographs, I already know how their lives ended. For those who survived, however, these records detail just a few years of their life. The rest of their life remains a mystery. The finding aid and scans are available here. If you have any questions, contact the University Archives!